The Decorina : Why does it work? Unraveling the elements of design. -Pale flooring(carpet), walls and ceiling open the space and make it appear larger. 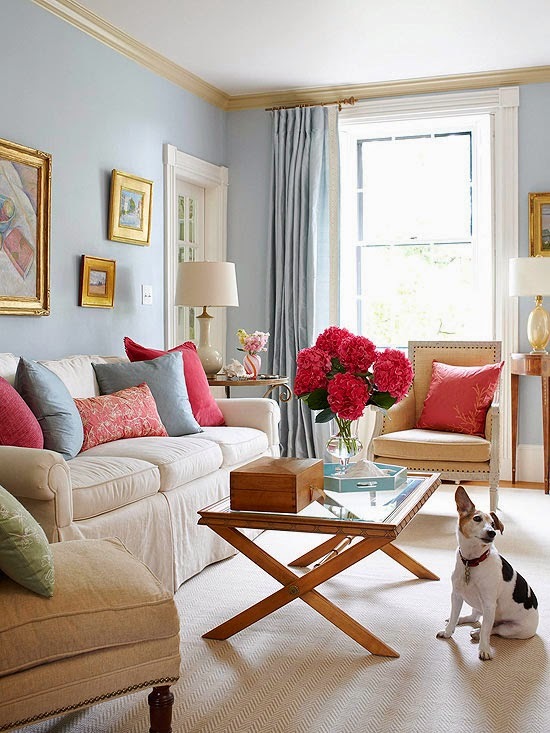 -The walls and drapery are the same color, and the upholstery is all neutral, allowing for a serene setting, and also drawing your focus to the pops of color in the throw pillows and floral arrangement. -A glass topped cocktail table takes up less visual space in a small room. -Light stained wood tones also contribute to the light airy feel of this space. Good luck beautifying your space!